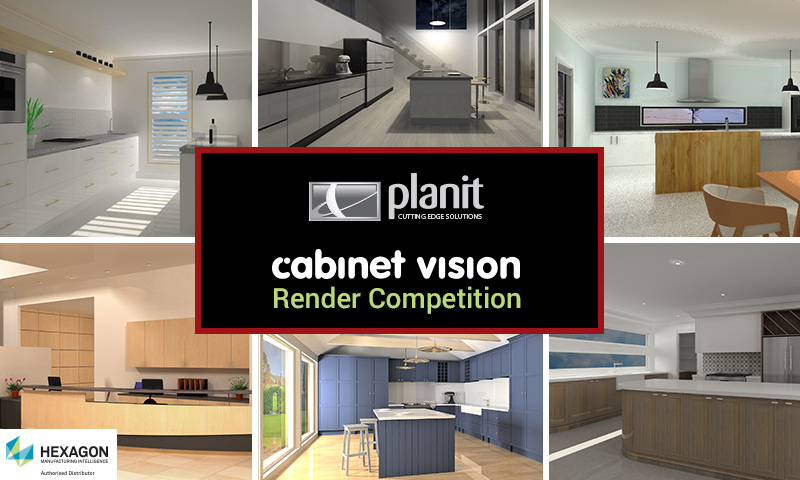 Planit are excited to launch our first ever Cabinet Vision Render Contest! Why not promote yourself, your business, and take the chance to WIN some money? This competition is a great way to test your skills using Cabinet Visions rendering tool, Photo Vision, and showcase your work and the great designs you have achieved in Cabinet Vision. Each individual can submit up to 3 rendered images. Upon all entries submitted, a list of finalists will be selected who will then have their designs uploaded to our Planit Facebook page. Over the following 3 weeks, people will be able to like the designs, with the winner determined by most likes at the end of the voting period. Voting will begin Wednesday 22nd May and close Midnight 5th June 2019. Please ensure you have read our Terms & Conditions below before submitting. Entries Close Friday 17th May 2019. To enter, simply fill in your details and submit your rendered image/s with the form (maximum of 3 entries per person) and make sure you're following us on Facebook for more updates. Competition is for Cabinet Vision Customers located in Australia & New Zealand Only. 1 Image per entry, Maximum 3 Rendered Images can be entered per designer. Competition is based on customers using Cabinet Vision Version 11. Upon submitting designs, you give Planit permission to use images in any future marketing activities that Planit deem suitable (Planit will reference the entrants company name where deemed suitable). Planit reserves the right to request additional files to determine the eligibility of the submission. Designs must be submitted by Midnight, 17th May. Voting Closes 5th June at Midnight. $250 Visa Gift Card will be sent to the winning designer. We will contact that person on the 6th of June to confirm mailing address. Please allow up to 3 weeks to receive this prize. $500 Fuel Voucher will be a Caltex Fuel Card, and will be sent to the primary contact of the winning company. Please allow up to 3 weeks to receive this prize. 10% off Planit Purchase will be for your next order with Planit (whatever that may be) and will be deducted after signing of the order. Can be used in conjunction with other discounts. Valid for 12 months. In case of any discrepancies, Planit Marketing has final say on all decisions.